Experience the Falcon as it was envisioned by the great Jimmie Webster in 1955. 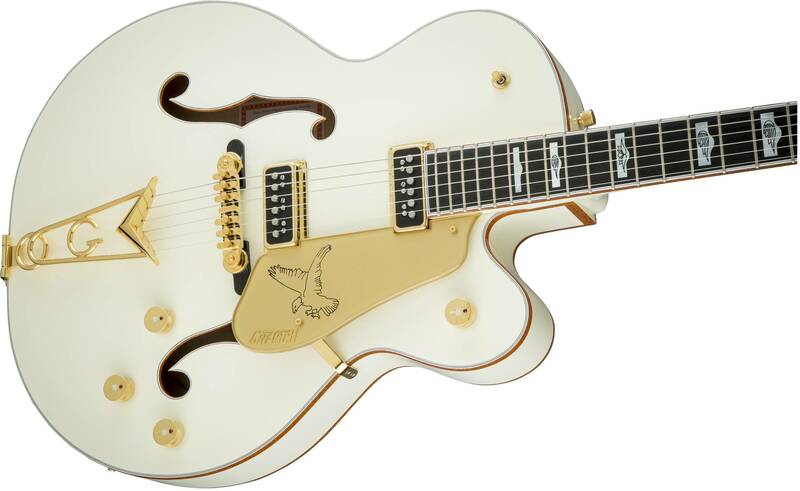 The G6136-55 Vintage Select Edition '55 Falcon™ Hollow Body with Cadillac Tailpiece is a true “Dream Guitar” that will be the hallmark of any guitar collection. Fluid playability, robustly flexible tone and, of course, stunning Falcon style combine for a big, bold instrument that pops in the spotlight. 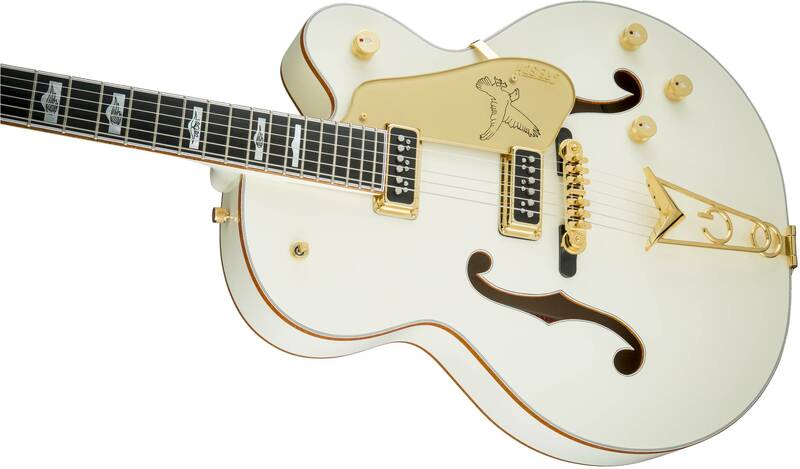 A pair of TV Jones® T-Armond single-coil pickups and the new Gretsch “Squeezebox” paper-in-oil capacitors power this sonic raptor for crystal-clear transparent tone that lets the soul of the guitar’s definitive hollowbody tone shine through. The Synchro-Sonic™ bridge not only lends original-era authenticity, it offers pinpoint intonation accuracy, locking into place with a thumbscrew for tool-free adjustment. Parallel tone bars reinforce the solid spruce top mated to laminated maple back and sides for powerful, balanced sound and increased projection from the 2.75”-deep body. The 12”-radius ebony fingerboard with 22 medium jumbo frets and elegant mother-of-pearl Hump Block and feather inlays tops a maple neck with a comfortably familiar standard “U”-shaped profile for supple playability, making complex chords and intricate single-note playing effortless. 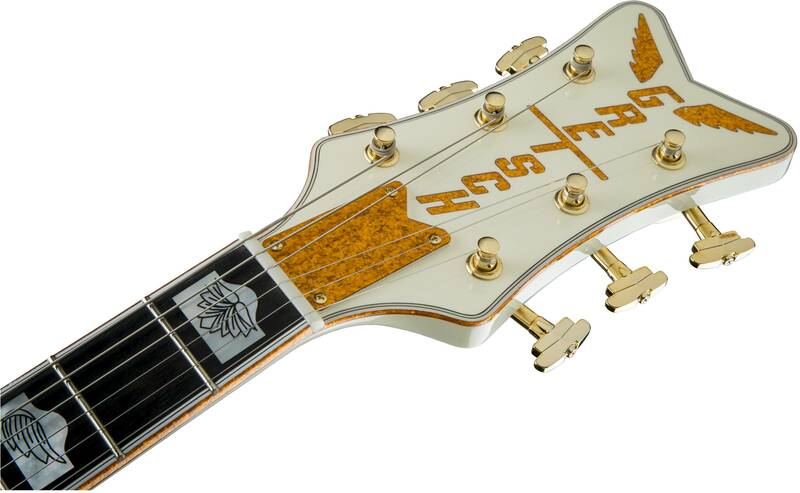 The White Falcon drips with sophisticated class, sporting shining gold hardware—including the iconic Cadillac “G” tailpiece and gold jeweled arrow knobs—gold sparkle bound neck, body and F-holes, gleaming vintage white gloss nitrocellulose lacquer finish and gold, vintage thick plexi pickguard with Gretsch logo. 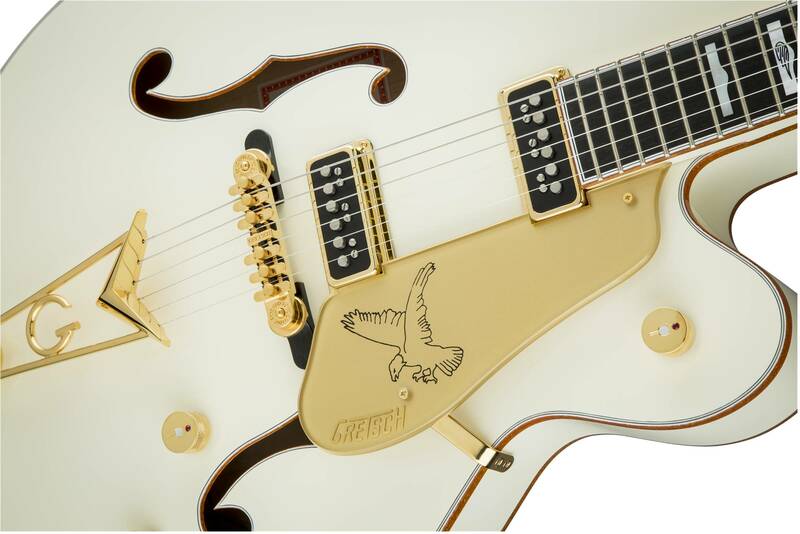 The iconic G6136-55 Vintage Select Edition '55 Falcon™ Hollow Body with Cadillac Tailpiece is the quintessential “Holy Grail” guitar. Includes a deluxe hardshell case.